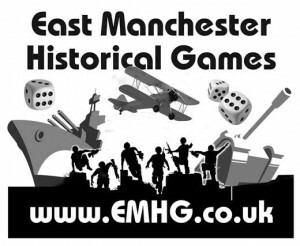 East Manchester Historical Games was created in 2007 to act as a body to further the advancement of wargaming in the Hyde and Manchester area, and wherever possible bring players from other areas outside Greater Manchester to play in games in the Hyde area. A further, important purpose of the society is to provide the opportunity for members to participate in the hobby of collecting and painting military miniatures and researching military history and the history of conflicts whether local or worldwide. As a society, we are also interested and involved in academic research (often international with contacts in other countries) – some of which has already been published – whether related to specific regiments (especially local), individual events within a wider conflict or the impact upon the individual (whether serving soldier, prisoner of war or civilian). Obviously, to achieve this, an appreciation of social history is a necessary adjunct – why conflicts happen and their social and economic consequences. We would hope that, in time, our society will become a valuable community resource. We are a group of wargamers who, back in 2007, had the opportunity to purchase a redundant Scout Headquarters & turn it into a centre for miniature wargaming & historical research. In addition, the society is willing to liaise with the history departments of schools and to make club resources and the expertise of members available as well as becoming involved in any local events with a military or historical theme; we would also hope to generate interest from the Manchester Regiment Museum at the Town Hall in Ashton, again, possibly supporting events that they are running.